Huge wahoo caught on a sportfishing charter. Great catch Linda! February is here and that means the wahoo bite is on. 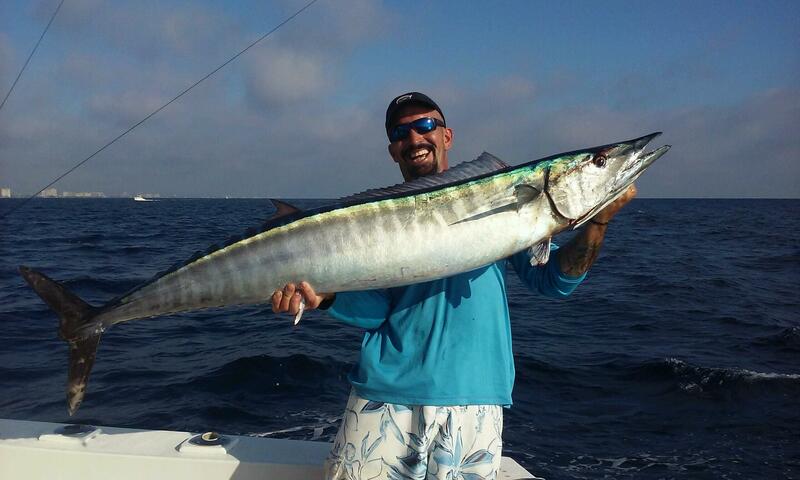 February is a top month for wahoo fishing in Fort Lauderdale. We catch wahoo in one of 2 ways, either by trolling or dragging live baits around. Trolling is the best technique. First off, wahoos love a fast moving bait and trolling allows us to pull lures around at a good clip. It also allows us to cover a lot of ground with the baits. Wahoo love deep running lures. We always pull a few baits around on planers, which pull the baits deep, down to the lower water columns. When the planer bait goes down hard and starts taking drag super fast, we know it’s a wahoo. A lot of wahoos get off the line, either by cutting through the monofilament or wire leader with their razor sharp teeth, or by shaking the hooks next to the boat. Wahoo are masters at shaking the hooks right next to the boat. Throughout the fight, the wear a larger and larger hole in their mouth where the hooks are. When they get close to the boat, they shake their head from side to side vigorously. If even a tiny amount of slack occurs between the rod tip and the hook set, the hooks can easily shake out. Wahoo are the Houdini of getting loose right next to the boat. Needless to say, wahoo are a true gamefish in both size, speed, strength and the sheer challenge it is to catch them. 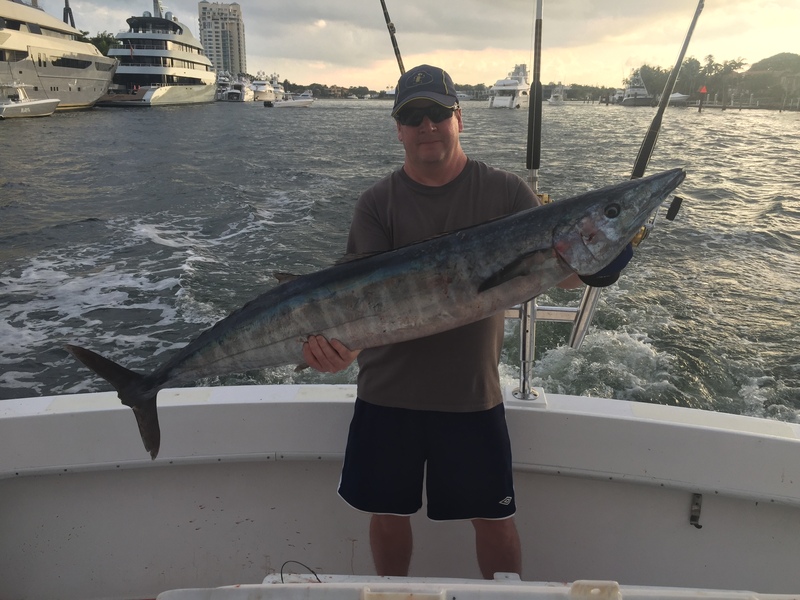 Another huge wahoo caught by this lucky angler trolling in Fort Lauderdale. February is tuna month. Tunas congregate on the reefs in February is big numbers. They school up in humongous schools, sometimes the size of a football field. When they are feeding on a school of baitfish, they emerge on the top of the water and ‘bust’ the schooled up baits on the surface. These busting tunas corral up a bunch of baitfish into a huge school and drive them up to the surface. From there, it’s a feeding frenzy where they eat the corralled up baitfish until there isn’t a single one left. It’s a dog eat dog world in the ocean. We can see these tunas from a long way off on a calm day. The ocean looks smooth and flat except for a football field size commotion where the tunas are busting. You can see it a mile away. When we see these tunas, we like to troll the outskirts of the school in circles. Tunas shy off as the boat encroaches on them, so its best to get close but not drive right over the school, which will drive them down. We usually catch them on small, light surface baits like dusters or small natural feathers. This time of year, blackfin tunas are our main catch. Once in a blue moon, we’ll catch a yellowfin. Yellowfin are extremely rare in Ft Lauderdale. Blackfin tunas can reach sizes of 40 pounds although most of them are 5-8 pounders, the size of a football. This is a great month to catch lots of blackfin tunas so bring the wasabi! 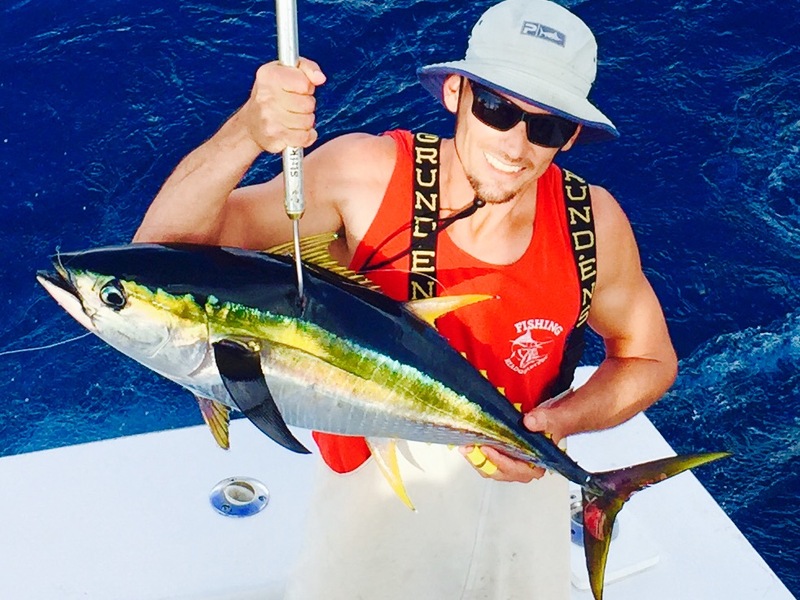 Capt Brett with a rare yellowfin tuna caught on our sportfishing charter. Sailfish is the other main attraction here in Fort Lauderdale this month. This is the last good month of sailfishing in south Florida until next Fall. While sailfish are here year round and can always be caught, the concentrated numbers of them bite best in the Fall and Winter months. March is generally when sailfishing starts slowing down. But February is a GREAT month to catch sailfish, in fact, it’s one of the best months of the year. The cooler temperatures of February get the sailfish really lit up and aggressive. 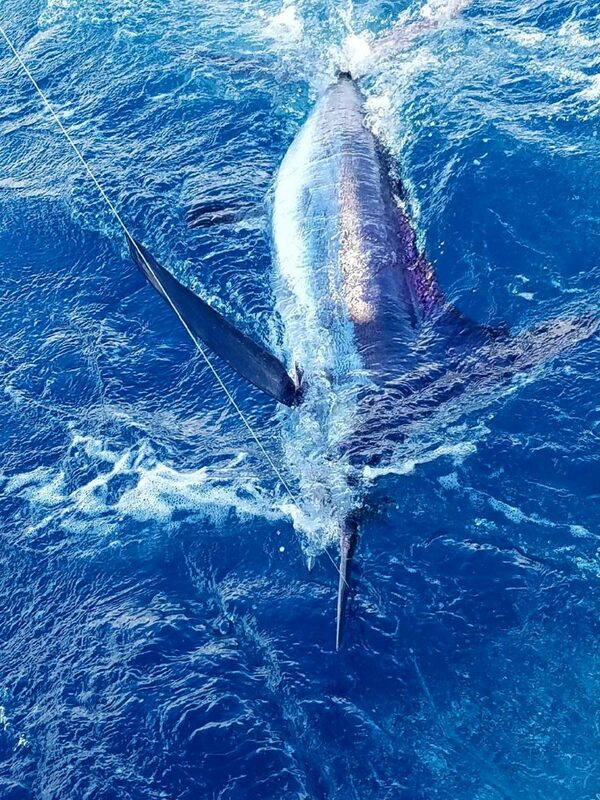 The stronger easterly winds of February also help the sailfish action and allows us to do a lot more kite fishing. Kite fishing allows us to go out and present live baits right on the surface of the water and keep them right on the current edge. This is a very effective technique to catch sailfish and although they are never guaranteed, you won’t find better conditions for sailfishing any month of the year. Sailfish are the most sought after gamefish in the entire world and anglers come from all around the world to catch these magnificent billfish. The most awesome thing about sailfish other than their colors and beauty, is the spectacular aerial display they put on during their fight. They jump out of the water like no other fish and take sudden fast runs throughout the battle. If you’ve never caught a sailfish before, it’s a rush like no other. 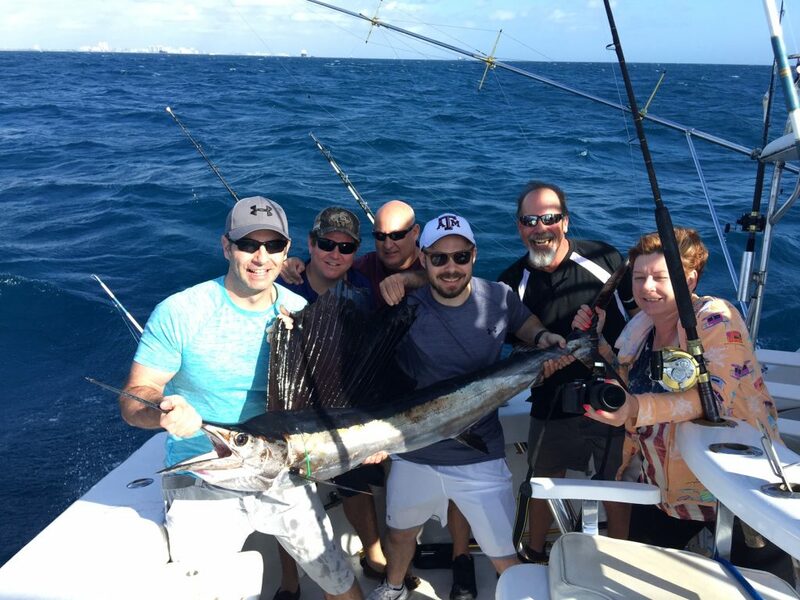 Big sailfish caught on our sport fishing charter. 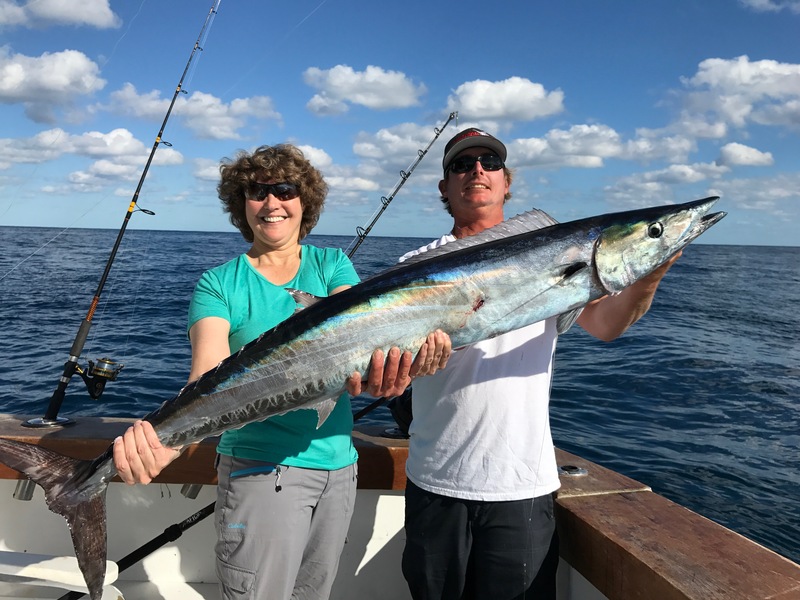 Many other species bite well in February but these top… wahoo, tuna and sailfish are what makes February famous for one of the best months of the year to go fishing in Fort Lauderdale. Some of the other fish that are possible this month are amberjacks and groupers around the wrecks, mahi-mahi are sometimes biting, kingfish and barracudas on the reef and lastly, huge sharks begin making their run down out coastline this month. The shark migration that begins in February and end in late June is truly epic, but is the topic for future fishing report. Good luck to everyone fishing this month. Tight Lines and Let’s Go Fishing!